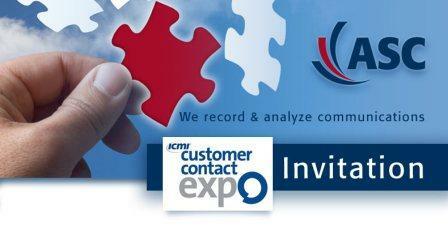 We invite you to visit us at customer contact expo at booth #G21, National Hall, London Olympia – 1st to 2nd October 2014! These applications are having a huge impact on FCR and customer satisfaction levels leading to higher Net Promoter scores, improved efficiencies, increased sales and profitability. Moreover, the recording component complies with PCI DSS guidelines and Governing Body legislation. Please call 01276 676070 to schedule a meeting with us at our stand or outside of the show. Be the first to comment on "Asc telecom Showcase neo WFO suite at Expo"